A good steak is even better when it has a yummy steak sauce to accompany it. The great thing about cooking a sauce for your steak is that it can add amazing flavor without needing to ruin a gorgeous chunk of meat with ketchup or mayonnaise! Steak sauce shouldn’t be too complicated or take too much time. The focus should always be on the centrepiece of the meal, the steak. In a saucepan over pre-heated high heat, mix together and gently blend the raspberry jam, sugar, Worcestershire sauce, tomato passata, vinegar (of your choice), hot pepper sauce (or chilli), salt and pepper. Bring to a boil over high heat, reduce heat to low and simmer 10 minutes or until thickened to a nice consistency. 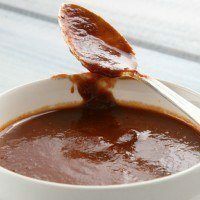 If you prefer it thick, then leave sauce on the heat slightly longer than stated. Elle-Rose works for Lomito, a steak restaurant in London, as a food writer.